Deeply concerned, I contacted Councilor Memhard the following morning. As a City Councilor, he too was very surprised to learn what was said of him. Councilor Memhard was under the impression, as are we, that we are all working toward a change in the ordinance. There has been some kind of breakdown in communication in moving forward in our efforts to help the Piping Plovers. The all-volunteer AAC has done an outstanding job in researching, and in their recommendations, on how better to help these tiny threatened birds that each spring call Good Harbor Beach home. Mayor Romeo Theken’s administrative office, Mike Hale and the DPW, Chief McCarthy and the Gloucester Police Department, along with Animal Control, plan to provide greater support in the coming months. The members of the Animal Advisory Committee, under the excellent leadership of Alicia Pensarosa, and the Good Harbor Beach Piping Plover volunteer monitors are a stellar group of individuals who have worked tirelessly to help our little Piping Plover family. As a community, I hope we can continue to work together to give the Animal Advisory Committee members and the volunteer monitors all the support needed to ensure we successfully fledge chicks. All that being said, the greatest threat to the Piping Plovers is the lack of common-sense dog restrictions at Good Harbor Beach during the month of April, coupled with only partial enforcement of the current ordinances during the bird’s nesting season. During the entire month of April 2018, we observed the nesting pair of Piping Plovers regularly encounter interruptions from dogs off leash running through the nesting area, dogs chasing the birds, and dogs—just being their sweet curious selves—coming up to the PiPl while they were courting, mating, and feeding. Eventually, the pair were completely driven off the beach and forced to nest in the parking lot. The PiPl perceived the parking lot as the safest place because it was early in the season and the parking lot, for the most part, during the off season is a low-traffic area. The PiPl had made a nest on the beach and would have begun hatching eggs a full ten days to two weeks earlier if they had not been driven off the beach and forced to establish a new territory in the parking lot. The importance in allowing the birds to nest early cannot be overstated. If our Piping Plovers are allowed to nest early in the season, their chicks could well be on their way to fledging by time the summer tourist season is in full swing. Piping Plovers have been shown to have tremendous fidelity to their chosen nesting site. There is one male documented who for fifteen springs nested at nearly the exact same location, arriving on exactly April 13th each year. Additionally, a statement was made by Councilor Holmgren at the AAC meeting that she personally felt that dog owners who had not broken the rules should not be “punished” by changing the ordinance to disallow dogs from the beach beginning April 1st. This misses the point entirely. No one in any way shape or form is trying to “punish” fellow dog owners. 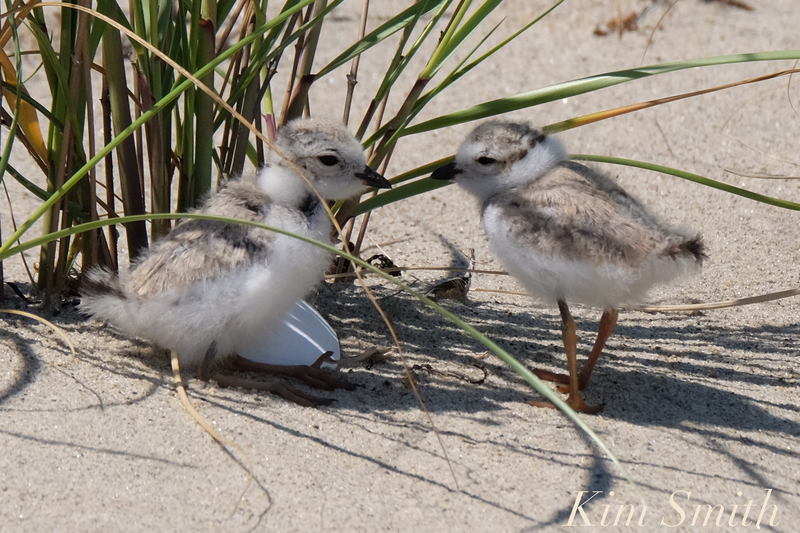 It has been documented on Good Harbor Beach, as well as in numerous studies, that simple, normal dog behaviors negatively impact the nesting and feeding of innumerable species of shorebirds, not just the threatened and endangered Piping Plovers. Out of a total of eleven Piping Plover chicks hatched at Good Harbor Beach since 2016, only one has survived. I think as a community we can do much, much better than this, but we need everyone working together, with the proper ordinances in place, to help the AAC and Piping Plover monitors do their work. This entry was posted in #sharetheshore, Birds, Birds of New England, Cape Ann Wildlife, Gloucester Plover, Piping Plover and tagged #sharetheshore, Beautiful Birds of Cape Ann, Charadrius melodus, dog disrupting Piping Plovers, dog ordiance massachusetts beaches, dog ordinance change, Gloucester Masachusetts, Good Harbor Beach, Piping Plover, Plovers on February 24, 2019 by Kim Smith.